A ton of storage with a small footprint, our vertically stacked Lockwood Shaker Armoire offers four drawers and an adjustable shelf cabinet that is perfect for housing clothes and linens. Bench built using premium North American hardwood, this solid wood armoire draws inspiration from the classic Shaker style, emphasizing utility and natural beauty through simplicity - giving you a set that can easily fit in a variety of different decors. 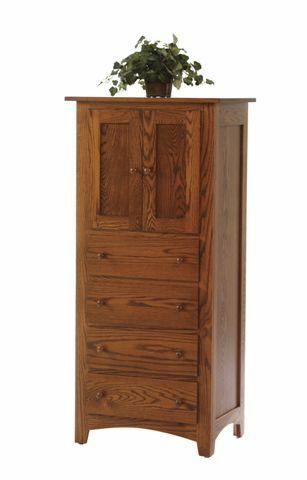 From classic to modern and anything in between, this storage tower will look good in any bedroom in your home. Cut from a different mold, the Lockwood Shaker Armoire has so much to offer, while only utilizing a small amount of floor space with its small footprint. On the top of the piece, the large, thick top is ideal for housing small decor items or even a small dresser top jewelry box for safe keeping. Below lies a two door cabinet that opens to reveal and removable or adjustable shelf, giving you room to house spare linens or folded items with ease. As you move down, four matching drawers are available to house your clothes and delicate items for easy access. Each dovetailed drawer box is crafted with a solid 1/2" bottom and is affixed by side-mounted, ball-bearing slides that fully-extend away from the case, giving you complete access to everything inside. So, feel free to load these drawers to the gills, because the high quality slides are rated to support 75 lbs. - offering you a lifetime of consistent service. While this piece comes standard with amazing features, there are a few extra options you may want to consider, to make this piece your own. Drawer Slides - Upgrade to the smooth motion, hidden look of our undermounted glides to create a one-of-a-kind look. Attached under the drawer box, these glides offer a "floating" look to your drawers that has a huge impact on the overall look of the piece. Along with that, you also benefit from the full-extension away from the case and a unique soft-close feature that ensures you never accidentally slam a drawer again. Upon closing, a mechanism engages and glides the drawer box smoothly to a complete and quiet close, every time. Hardware - While hardware does come standard, we offer a few different options to help you make this piece an extension of your personality. All crafted from high quality materials and finished to a beautiful luster, the hardware used in each collection is sure to make a big statement on the piece. If there was a different hardware you were interested in, give us a call to request a custom quote. Dust Panels - An often overlooked addition to your storage piece, the built in dust panels are crafted between each drawer, out of sight, offering a simple way to keep dust from accumulation on the clothes below. This simple addition goes a long way for less frequently worn clothes, ensuring they're ready when you need them, without having to rewash them if they become dusty. Cedar Drawer Bottoms - Aromatic by nature, the cedar drawer bottoms will naturally pull moisture from the drawer box and impart a clean fragrance to your clothes and linens. A small addition that will have a huge impact on the overall enjoyment of the piece. Did We Miss The Mark? Inside Door Opening Width: 20"